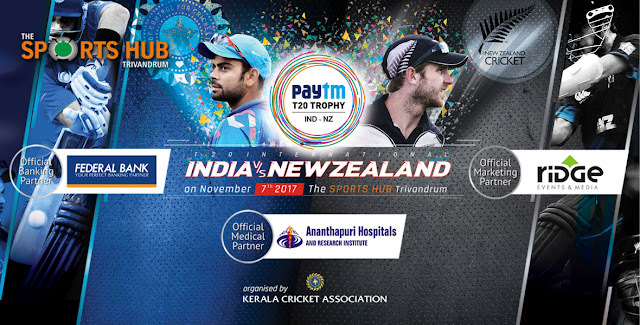 Kerala Cricket Association announces the ticket sales details for the T20i Cricket Match between India and New Zealand scheduled to be held at Trivandrum International Stadium on November 7,2017. The online ticket sales will start from October 16 till October 29, 2017. These tickets will be available via the websites of Federal Bank Ltd (www.federalbank.co.in) and Kerala Cricket Association (www.keralacricketassociation.com). These online tickets have to be collected in "originals" from the Cotton Hill Branch of Federal Bank at Vazhuthacaud from November 1, 2017 to November 6, 2017 or from the special ticket counter located at the main gate of the Stadium (Opposite to University of Kerala, Karyavattom Campus) from November 5, 2017 to November 6, 2017. Also, the tickets will be available from the selected branches (as listed below) of Federal Bank from October 30,2017. 5000 seats in the Upper Level are reserved for the students at 50% discount ie at ₹ 350/- . To avail this, students need to produce the authorization letter from the concerned School/College where they study. Also, they need to produce their identity card at the Stadium entrance gate on the Match Day. Match Starts at 07:00 pm IST.